In the last chapter (chemical propulsion) it was told that there is a propulsion technology that is being used increasingly: electric propulsion. In this chapter we will see how it can achieve ejection speeds exceeding 50 km/s, thus allowing enormous mass saving. The main idea behind electric propulsion is using electricity as the source of energy, instead of the chemical energy stored in propellants. The electric power used by thrusters has to be generated elsewhere. This is typically done by solar panels, but nuclear power (either fission or fusion) could be a feasible source of energy in the middle term. It can then be said that electric thrusters are “power limited”: there is a limited power they can use for accelerating the reaction mass, but there is no limit to the amount of energy they can use – it will only require more time. This is essential to achieving very high ejection speeds. There is a type of electric propulsion akin to chemical propulsion: electrothermal thrusters. They use electricity to heat up a gas and then expand it thermodynamically in a nozzle. They are subject to the same limitations as chemical thrusters, so they do not produce large thrust. However, they are simple and precise. 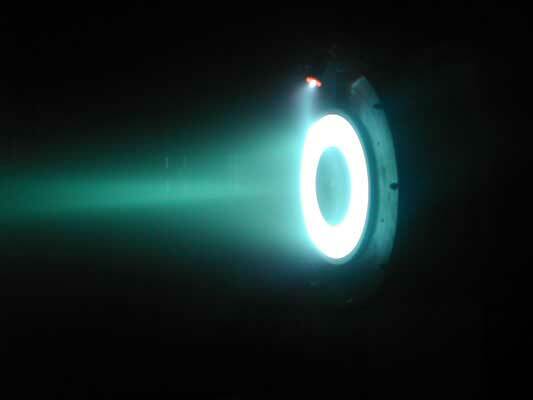 The most interesting type of electric thrusters, however, are plasma thrusters (two types are being used nowadays, ion and Hall effect thrusters). Plasma dynamics can be a very complex field, but its working principle is pretty simple. First, a gas (typically Xenon) is injected into the “acceleration chamber”. The gas is then ionized: some electrons are taken out of the outer orbitals of the atom, thus making it positively charged. There are many ways to ionize a gas, ranging from radio frequency to electron ionization. Then, it is accelerated with an electric field, reaching ejection speeds of up to 200 km/s. Upon exiting the thruster, it is “neutralized” with electrons (to avoid charging of the spacecraft). These ejection speeds can allow massive fuel savings. However, since electric thrusters are power limited, they are usually limited to very low thrust – about less than half a Newton. Historically, plasma thrusters were used mainly for secondary propulsion, since it does not require big thrusts. At the present, satellite designers are starting to use it for primary propulsion in telecommunications satellites, since the decrease in propellant mass allows bigger payload. If electric propulsion is used, trajectories have to be re-thought. Chemical thrusters offer high thrust and are used in short impulses, whereas the low thrust of electric propulsion needs very long manoeuvres. There are numerous propulsion technologies that were not treated in these articles. Some of them are already obsolete. Others are promising technologies. Some are nothing but distant dreams. If you have read this series of articles, you are now able to understand these technologies, and why they are the way they are. You should now be capable of understanding the main ideas behind space propulsion when reading about it, and what the stakes are. Should you have any doubts, or feel I should cover some topic interesting to you that wasn’t mentioned here, don’t hesitate to say so in the comments section. The next chapter will be the final chapter of the “Space Propulsion” series. As a kind of epilogue, it will deal with a method to increase a spacecraft speed without any propulsion devices.